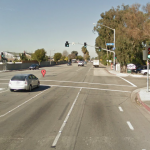 CANOGA PARK (July 17, 2014) – A female bicyclist was killed on Thursday after a car involved in a collision with another car fatally strikes her. 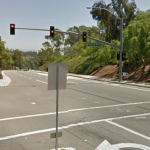 Two cars were involved in a Thursday collision at the corner of Shoup Avenue and Sherman Way around 4:00 p.m. A southbound Toyota struck a Lexus which was in the process of making a left turn on Sherman Way. The Toyota driver than lost control of the car and careened into the sidewalk where it struck the female bicyclist. The female bicyclist had no identification on her at the time of the accident but was pronounced dead at the scene. She was described as a woman in her 40′s. As soon as her identity is released we will update this posting. A police investigation is underway as officers determine if alcohol played a factor in this accident. The corner of Shoup Avenue and Sherman Way is main thoroughfare that gets busy especially during rush hour traffic. Witnesses should contact the Valley Traffic Division at 818-644-8000. Our condolences to the family of the bicyclist killed in this tragic accident. This kills me…I have read many reports regarding this accident and I was there at the scene, however I did not see the accident but if anyone who reports a accident needs to get the facts straight before reporting anything. Any lawyer or Insurance Company will tell you that if a car is making a Left hand turn into uncoming traffic it is primarily there fault even if the light is turning from yellow to red the car turning left MUST make sure that all traffic has either cleared the intersection or has come to a complete STOP before turning. Unfortunately yes a innocent bystander has lost her life and I am very saddened by this.